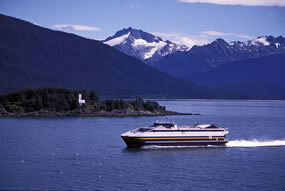 Alaska's fast ferry, the M/V Fairweather. All routes within the Alaska Marine Highway System (AMHS) are, collectively, an All-American Road. Locals and visitors ride Alaskan ferries together in a relaxed atmosphere, through some of the most breathtaking scenery in the world. The "Inside Passage," extending from Queen Charlotte Islands of British Columbia north to Skagway, is a region of dramatic fjords, pristine islands, and forests of tall hemlock and spruce. Rich in history, the towns and villages of the Inside Passage will provide a unique opportunity to explore the region's abundant and diverse cultural experiences and scenic wonders. Over 1,500 islands protect this route from large Pacific Ocean surges. Visit Juneau, home to the Alaska State Capitol and the magnificent Mendenhall Glacier. Grab a pole and see why Ketchikan is the salmon capitol of the state. Check out why the little fishing community of Petersburg is called Alaska's "Little Norway." Visit Totem Bight State Historic Park in Ketchikan to see totems and a replica of a native clan house. View the highest concentration of petroglyphs in Southeast Alaska in Wrangell at Petroglyph Beach State Historic Park. Explore Sitka for its early Russian influence and rich Tlinget culture. 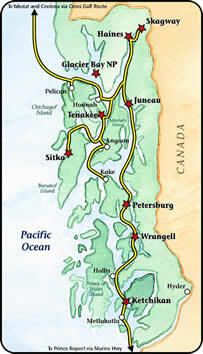 Sitka was the capital of Russian America and Alaska's first state capital. In Skagway, walk in the footsetps of gold hungry prospectors headed for the Klondike. While you're in Haines, charter an unforgettable glacier flightseeing tour or visit the Chilkat Bald Eagle Preserve.